At first glance, a visitor might see the rough edges around Kensington and miss the strengths and stories that co-pastors Rev. Rebecca Blake and Rev. Karen Rohrer work at to encourage and uplift. A historically industrial Philadelphia neighborhood with residents who still take great pride in working with their hands, Kensington has seen many factories, businesses and even churches that once thrived there become a thing of the past. Despite the change in the landscape of Kensington, the Beacon Presbyterian Church held its ministry there for 140 years. However, attendance problems threatened the church to close its doors. 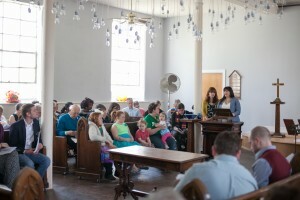 That’s when the Presbytery of Philadelphia stepped in, fueled by the creativity of Broad Street Ministry, which sent in a pair of former interns with backgrounds in art and service to help revitalize the congregation. Blake and Rohrer, fresh out of Princeton Theological Seminary, decided to try something different. 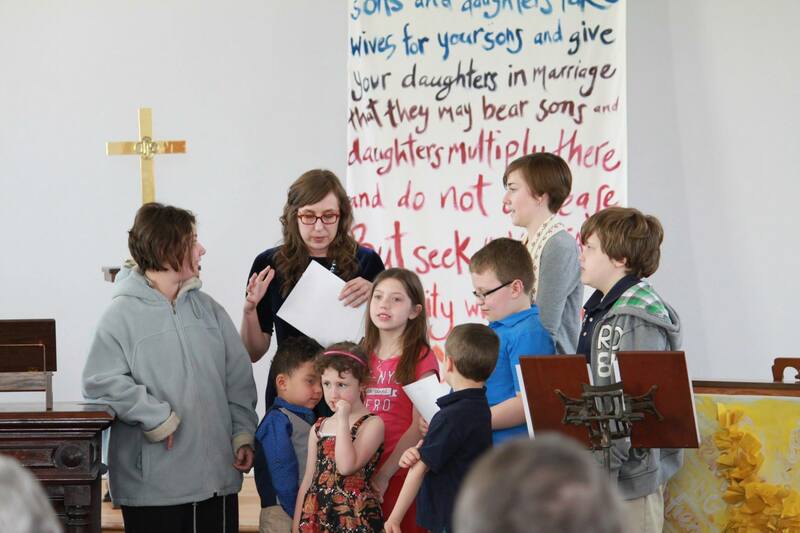 The now ordained ministers changed the church’s name, moved the Sunday morning worship to Sunday evening and created three weekday afternoon workshops at the “Studio at Beacon” that are targeted for the youth in the Kensington area. It has kept the doors open and created a new excitement on East Cumberland Street in Philadelphia. Somewhat surprisingly, Blake and Rohrer don’t talk about religion during the three weekday workshops at Beacon, partly because of the secular funding that helps keep the art programs afloat. But that doesn’t mean the subject doesn’t come up. The 30-year-old Blake didn’t fully grasp her art ministry tools until her internship and eventual employment at Broad Street Ministry. That’s where she learned that anyone can enjoy and benefit from telling their story — and encountering sacred stories — through art. It was that mindset that she and Rohrer, 28, brought to Kensington in 2011, the year Beacon Presbyterian Church was dissolved and simply “Beacon” was born. At the time of the switch, only 10-15 people attended the Sunday morning worship service. Blake and Rohrer have been able to double that number with their new evening service and also average between 30-40 youths, mostly between the ages of 5-12, with their three weekday afternoon workshops. So all told, Beacon is now reaching close to 50 adults and children in a week’s time, which might not sound like a lot to some, but considering the Kensington building was nearing extinction, it is quite a success story. “The weekly numbers may seem on the smaller side, but our reach into the neighborhood is fairly broad, and that’s something that we’re really excited about and grateful for,” Blake said. “It’s important to the PCUSA, to the Synod, to the Presbytery of Philadelphia that there is a faith community in this neighborhood, that the Gospel is being preached and lived here, regardless of how many people we have in the pew or how much or how little they are able to sacrifice financially. Beacon has a large property with a sizable patch of grass in the front, an area that used to house a sanctuary before it was destroyed by Hurricane Hazel in 1954. 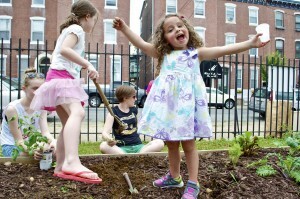 “It’s one of the few green spaces in the area,” Blake added. The building and space available were begging to be used for the right ministry. The week at Beacon starts with an open, approachable Sunday evening worship service that, once a month, includes a pot luck meal. Beacon grew its worship services from monthly to weekly, and morning to evening, to cultivate a culture of a wide welcome that allows for neighbors of all backgrounds to participate. “Regular attendance used to mean weekly attendance, and now ‘regular’ looks more like biweekly or even monthly,” Blake said. “That poses a challenge, but we have been able to build community among attendees despite that challenge. The rest of the week the Studio at Beacon is geared toward its art-centered programming for youth and occurs from 4-6 p.m. On Mondays, the Drop-In Studio is targeted at ages 11 and older. This centers on homework help, tutoring and art projects but also includes teaching the kids how to build fruitful relationships with peers and adults. On Tuesdays, the Story Studio takes place. It’s a creative writing program that “gets at literacy from a round-about perspective.” Instead of diagramming sentences, Blake said, students are invited to write using a creative prompt, and the teachers help them with things like spelling and sentence structure as they go along. 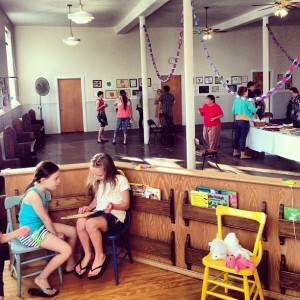 The Art Studio on Wednesdays is the most popular of the three weekday programs. It centers on art education through creative projects, with the youth making their creations their own and telling their story visually. So in a week’s time, the written word, spoken word and pictures are used by Beacon to help the youths express themselves. And it doesn’t come with any kind of religious undertones. Among the money Beacon has received is a $30,000 New Initiatives Grant from the Synod of the Trinity to help pilot a new program called the Mission Lab. The Mission Lab would bring in churches and other non-profit organizations to do creative experimentation and visioning in regards to their own community engagement by interacting with the community surrounding Beacon. Blake says Beacon also hopes to implement a yard update in the next few years that would include maximizing the space in front of the church to create particular areas for such experimenting, as well as play, vegetable gardens and contemplative practices. Art has many purposes as well, and those facets are being seen weekly at the Studio at Beacon in subtle ways that are bringing people back to Kensington. “There’s a lot of research about how expressing one’s self with different media adds and enhances and enriches their overall education experience and definitely builds community between different demographics of folks,” Blake said. Note: Anyone who is interested in Mission Visioning is invited to bring their mission committee, session or leadership to Beacon for a day retreat, neighborhood exploration, service work, community prayers and/or visioning through art. Contact the Beacon for more information.